In case, you misplace your Aadhar card you can easily download a fresh copy of the same from the UIDAI website for free. Just like the registration process the process of getting a duplicate Aadhar card is also free of cost. You will just need your unique Aadhar card number to do so. But in case that is not available still it is possible to get a duplicate one. It is advisable to keep the unique number handy but in case you don't know the number when you lose the card you can get your number from the website. If you have somehow misplaced your aadhar card, you need to follow these steps to get a new one. First you have to go to the UIDAI website whose interface is very user-friendly. You will notice a drop down box which will give you two options. Choose UID number from the selection. Enter your full name as it appears on the misplaced Aadhar card. They will ask for your email id or the mobile number next. Provide them the one which you are connected to at the moment as the number will be sent in this place. The email number or phone number needs to match with the one provided during registration. Enter the security code that appears on the screen. After the request is processed your unique id will be sent through SMS or e-mail. So if you already had the number or if you followed the above to get the number then you can proceed to the next set of instructions to get your duplicate Aadhar card. 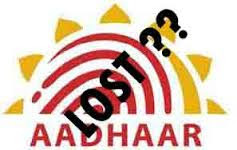 Go to the e-Aadhar page. The UIDAI website at aadharcarduid.com/download-duplicate-copy-online will provide you with the duplicate card. You will have to enter your name, pin code of your postal address and the Aadhar card number. The name and the pin code needs to be identical to the one that appears on your misplaced Aadhar card. Enter the security code that is displayed on the screen. You will be asked to confirm your number or mail id. Choose the option which will be convenient for you to use at that moment as a one-time password (OTP) will be sent there. Enter the OTP that will be sent your mobile or your mail id. Validate the option and download the file. The file is a password protected file. The password is the postal pin code of the address appearing on your Aadhar card. Put in the pin code once you open the file. Print the file and you will have your duplicate Aadhar card which can be used as an identity proof. The Aadhar card is an unique card can be used as a photo identity proof as well as an address proof. Hence, it is best to keep the actual card handy but in case you misplace it you can easily get a duplicate through the above instructions. 0 Komentar untuk "Precautions to take in Case of Aadhar Card Lost - Procedure to Download Duplicate Aadhar Card Online"